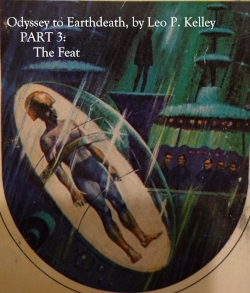 Ruiz Tremello and Marguerite are finishing up the tests on Alberto Einsteino; and presenting Part 3 of "Odyssey to Earthdeath", by Leo P. Kelley: "The Feat"! Phillip Villane, Ruth Cameron, Adam York, Grandsir, and Sister, continue their battle against Supreme Priestman Simon Pume, while the batle between Cityside and Landsend reaches critical mass! Leo P. Kelley (1928-2002) was an advertising copywriter who also wrote Western Novels, YA SciFi, and several novels, including The Accidental Earth (1968), The Coins of Murph (1971), and Time: 110100 (1972), where in this episode Ruiz accidentally refers to it as being named "110100" rather than the proper "Time: 110100", because the (first) website he sourced for research on Leo P. Kelley was wrong. “Odyssey to Earthdeath” was the first novel by Leo P. Kelley that Ruiz has ever been lucky enough to read, and he very much desires to read more by this talented and delightful author.